Part of the nature of foster care is the inevitable reality that you will have to say goodbye to a child you have cared for. It is never easy. Not ever. Sometimes the child has been in your care for a weekend or a month. Many times they have been with you for many months or even years. The amount of time varies, as do the reasons for their goodbyes, but those goodbyes are all bittersweet, sad, and difficult all the same. And since there is no crystal ball in foster care (trust me, I asked), we often prepare for our goodbye from the beginning. We take so many photos and create photo books of all the special times to help us to grieve when our child leaves. We try to remain positive and focused on the goal of reunification, despite the twists and turns we experience along the way. And we try really hard to create a relationship with the biological family. Sometimes that positivity pays off, too, when we get updates from former caseworkers who run into the family or get an email or text from the biological parent with photos many months later. Of course there are the times when you get news that is less than positive about a reunified situation or say goodbye to a child when you feel uneasy about where they are going. Those are heartbreaking and frustrating. Those make you want to quit, to be quite honest. And those are the times you need to listen to your heart and your family’s heart. If you need a break, take one. If you need to talk to someone, you should. Being a foster parent can be emotionally draining and isolating. It is absolutely a roller coaster ride of emotions. Being aware of this and being honest with yourself is the best thing you can do, even if that means you can’t open your home for another child again or at least not right away. For us, once a child leaves our home, we take a few weeks and try and do something special as a family of four again- a trip or fun night out or family sleepover in the living room, just something to remind each of us how hard it is to do foster care, and how important it is that we will always put our family as a priority. When we initially talked about doing foster care, we knew we would have to say goodbye over and over again, and it scared us. But with each goodbye we’ve said our hearts have grown, not shattered, and we have learned that what we do with our present time is far more important than trying to predict the future. Some kids stay in foster care for a day or two and some stay for years before returning home or to a family resource. This is one of the most challenging times for foster parents – especially when they have concerns about the environment the child is returning to. The courts look at family as a priority and while the biological family may not be able to provide the same level of care and extra activities as the foster parent, they are considered the first option. The foster parent only becomes a potential resource when the courts have exhausted all family resources. When a foster child arrives at the foster home no one knows how long they will be there and the outcome of the case. County workers may provide their idea of where they feel the child will be living in the future but nothing is certain. I encourage our foster families to focus on one day at a time because each day that you provide safety and security for a child helps heal their past traumas, teaches them how parents should treat their children, and what a special person they are and how they are valued in the foster family. As soon as the child arrives foster parents should take pictures, save mementos of events that they have done as a family and special items that the child has created. When the child leaves they can take these items and photographs with them to help them to remember the special times with the foster family. When the courts decide the child is going to leave the foster home, both the foster family and foster child experience feelings related to grief and loss. Before the child leaves foster parents should take time to sit with the child and review their time together and share the items that have been saved. I encourage foster parents to identify the progress that the child has made while in their care, to honor the memories of the activities and experiences they have shared as a family and to remember that everyone grieves the loss in the family and needs time to heal. Even though staff have told you that foster care is temporary and reunification is the goal, the foster parent still forms a close bond with the foster child and experience grief when they move on. If a child is moving to an environment that the foster parent has concerns about I encourage families to remember that this is the court’s decision and while they may not think it is a good idea the courts have the final say in where the child lives. If you have been able to form a healthy relationship with the biological family they may view you as a support to them and the child which may allow you to get updates on the child’s progress and at times have visits. I have seen cases where foster parents have been child care resources for biological family members and have had ongoing contact with the child after they were reunified. Finally, I tell our foster parents to remember that every moment you spend providing a safe, nurturing and caring environment impacts the life of a child. 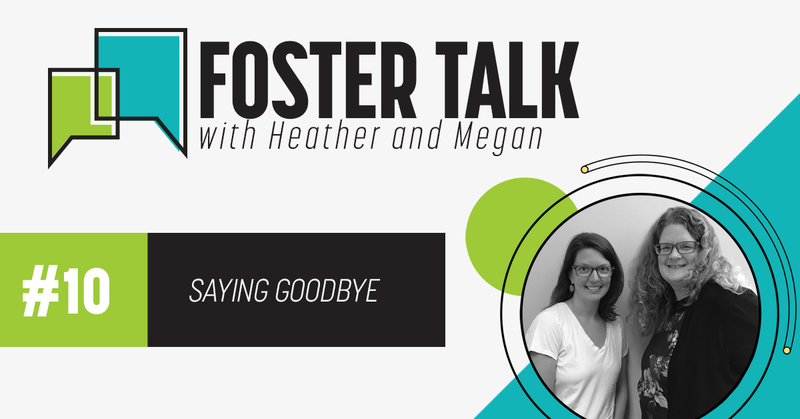 Thanks to Megan Craig and Heather Moore for their contributions through the Foster Talk blog series. Watch for more insights and new perspectives on the realities of foster care, when Foster Talk resumes later this spring! To Learn More About Becoming A Foster Parent………………………………………….